What do you understand by ASCII value of a character? Can we use expressions including both integer data type and character data type? Justify your answer. ASCII is American Standard Code for Information Interchange. ASCII is a character-encoding scheme and it was the first character encoding standard.ASCII uses 7 bits to represent a character. It has 128 code points, 0 through 127. It is a code for representing English characters as numbers, with each letter assigned a number from 0 to 127. Yes, we can use expressions including both integer data type and character data type. In such expressions, type conversions occur and the character datatype gets converted into its integer value. This integer value is the ASCII value of the character. Write the difference between type conversion and type casting. What are the escape sequences characters? In C programming language, there are 256 numbers of characters in character set. The entire character set is divided into 2 parts i.e. the ASCII characters set and the extended ASCII characters set. But apart from that, some other characters are also there which are not the part of any characters set, known as ESCAPE characters. The output is dependent upon compiler. What are the main principles of recursion? 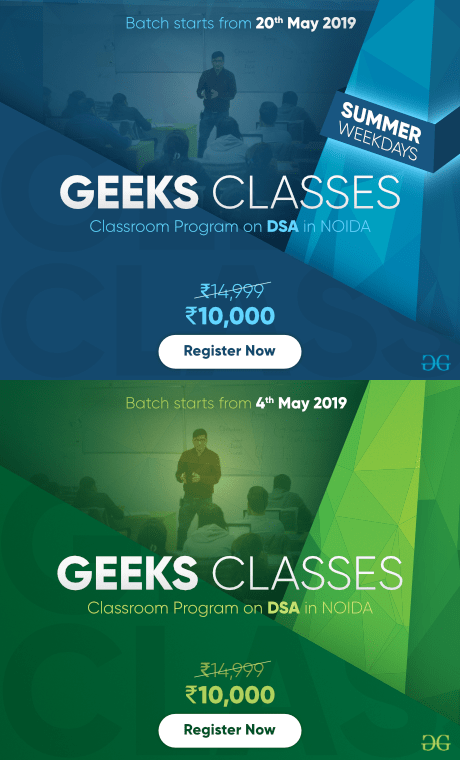 The process in which a function calls itself directly or indirectly is called recursion and the corresponding function is called as recursive function. Using recursive algorithm, certain problems can be solved quite easily. Examples of such problems are Towers of Hanoi (TOH), Inorder/Preorder/Postorder Tree Traversals, DFS of Graph, etc. What is base condition in recursion? In recursive program, the solution to base case is provided and solution of bigger problem is expressed in terms of smaller problems. In the above example, base case for n < = 1 is defined and larger value of number can be solved by converting to smaller one till base case is reached. As a = 2, b = 3 and x = 0 intitially. 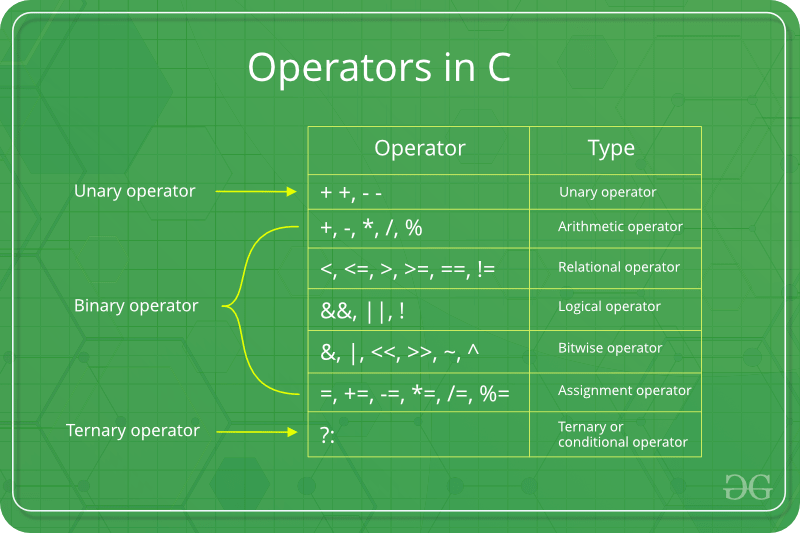 What are the different types of operators in C language and also write down the difference between the associativity and precedence of operators. Arithmetic Operators: These are the operators used to perform arithmetic/mathematical operations on operands. Examples: (+, -, *, /, %, ++, –). Relational Operators: Relational operators are used for comparison of the values of two operands. For example: checking if one operand is equal to the other operand or not, an operand is greater than the other operand or not etc. Some of the relational operators are (==, >=, <= ). To learn about each of these operators in details go to this link. Bitwise Operators: The Bitwise operators is used to perform bit-level operations on the operands. The operators are first converted to bit-level and then calculation is performed on the operands. The mathematical operations such as addition, subtraction, multiplication etc. can be performed at bit-level for faster processing. To learn bitwise operators in details, visit this link. Comma Operator: The comma operator (represented by the token, ) is a binary operator that evaluates its first operand and discards the result, it then evaluates the second operand and returns this value (and type). The comma operator has the lowest precedence of any C operator. Comma acts as both operator and separator. To learn about comma in details visit this link. (i) What is the role of SWITCH statement in C programming language? Explain with example. Formal Parameter : A variable and its type as they appear in the prototype of the function or method. Actual Parameter : The variable or expression corresponding to a formal parameter that appears in the function or method call in the calling environment. extern: Extern storage class simply tells us that the variable is defined elsewhere and not within the same block where it is used. Basically, the value is assigned to it in a different block and this can be overwritten/changed in a different block as well. So an extern variable is nothing but a global variable initialized with a legal value where it is declared in order to be used elsewhere. It can be accessed within any function/block. Also, a normal global variable can be made extern as well by placing the ‘extern’ keyword before its declaration/definition in any function/block. This basically signifies that we are not initializing a new variable but instead we are using/accessing the global variable only. The main purpose of using extern variables is that they can be accessed between two different files which are part of a large program. For more information on how extern variables work, have a look at this link. 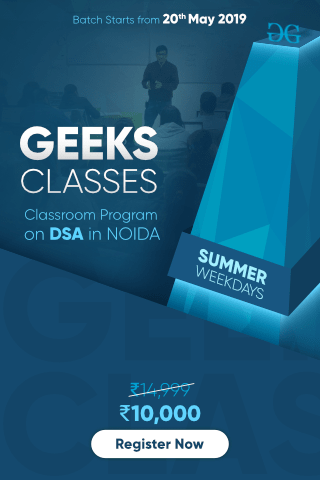 Global Variables: As the name suggests, Global Variables can be accessed from any part of the program. They are available through out the life time of a program. They are declared at the top of the program outside all of the functions or blocks. 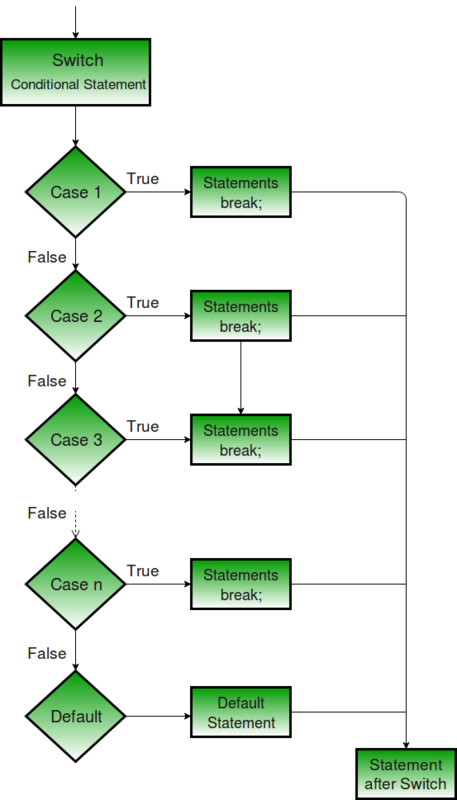 Declaring global variables: Global variables are usually declared outside of all of the functions and blocks, at the top of the program. They can be accessed from any portion of the program. Describe call by value and call by reference with example. There are different ways in which parameter data can be passed into and out of methods and functions. Let us assume that a function B() is called from another function A(). In this case A is called the “caller function” and B is called the “called function or callee function”. Also, the arguments which A sends to B are called actual arguments and the parameters of B are called formal arguments. Pass By Value : This method uses in-mode semantics. Changes made to formal parameter do not get transmitted back to the caller. Any modifications to the formal parameter variable inside the called function or method affect only the separate storage location and will not be reflected in the actual parameter in the calling environment. 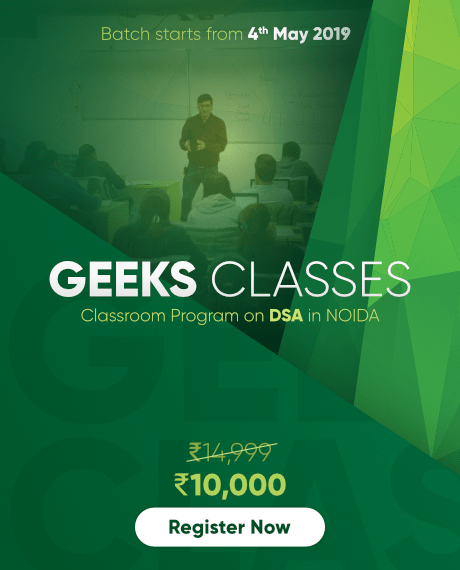 This method is also called as call by value. Languages like C, C++, Java support this type of parameter passing. 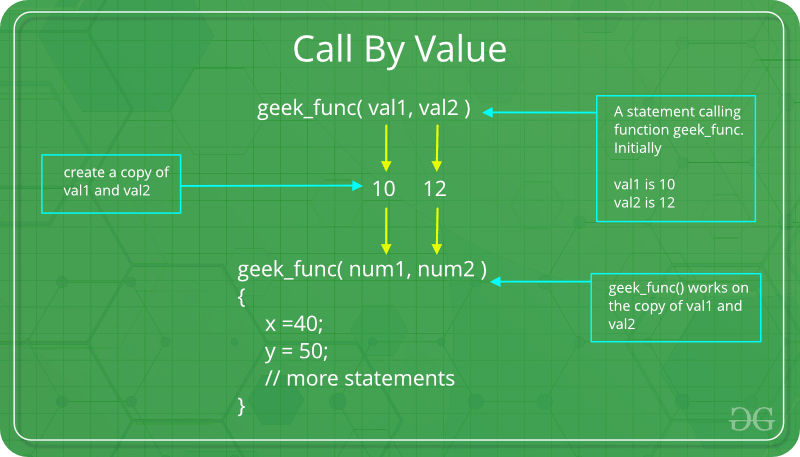 Java in fact is strictly call by value. Pass by reference(aliasing) : This technique uses in/out-mode semantics. Changes made to formal parameter do get transmitted back to the caller through parameter passing. 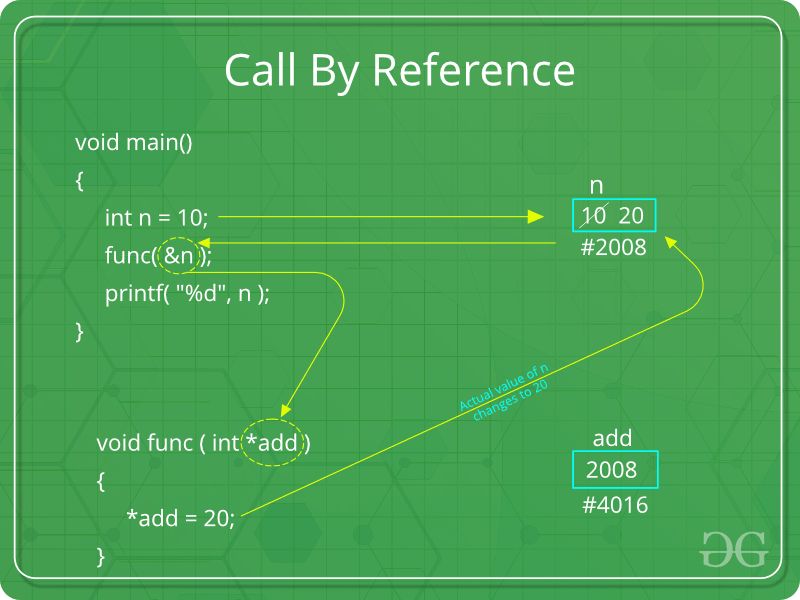 Any changes to the formal parameter are reflected in the actual parameter in the calling environment as formal parameter receives a reference (or pointer) to the actual data. This method is also called as <em>call by reference. This method is efficient in both time and space. Write a program in C language to generate the Fibonacci series. Dynamic Memory Allocation in C: It can be defined as a procedure in which the size of a data structure (like Array) is changed during the runtime. Lets see each of them in detail. “calloc” or “contiguous allocation” method is used to dynamically allocate the specified number of blocks of memory of the specified type. It initializes each block with a default value ‘0’. for 25 elements each with the size of float. If the space is insufficient, allocation fails and returns a NULL pointer. Memory successfully allocated using calloc. 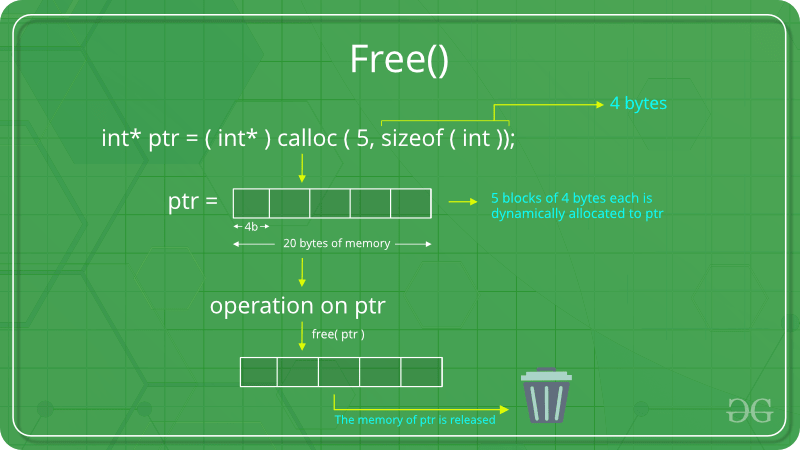 “free” method is used to dynamically de-allocate the memory. The memory allocated using functions malloc() and calloc() are not de-allocated on their own. Hence the free() method is used, whenever the dynamic memory allocation takes place. It helps to reduce wastage of memory by freeing it. Memory successfully allocated using malloc.